You are here: Home » Retro Recipe Challenge # 6 (Food of Love) Deadline in 12 Days! Retro Recipe Challenge # 6 (Food of Love) Deadline in 12 Days! Whether you’re shopping for that perfect box of candy (for your true love) or searching for that perfect pig’s heart (to nail to the door of your mean and horrible ex), don’t forget to stock up on ingredients for the latest Retro Recipe Challenge. 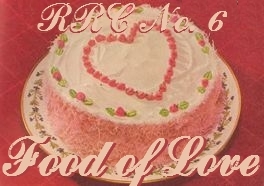 The theme is “Food of Love” and full details can be found here or here. Please (pretty, pretty please, with sugar and cream on top) email your entry by Sunday, February 11 at 11:59pm EST to RetroRecipeChallengeATgmailDOTcom.